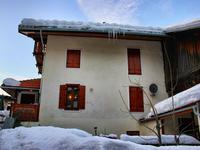 Spacious village house only 4km from world class skiing at Plagne Montalbert, La Plagne, Paradiski. Excellent value for money with 4 bedrooms, 4 bathrooms, small garden, driveway, terrace, barn/workshop and lovely vaulted cave with the potential to be a separate apartment. 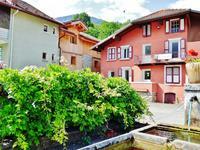 A character property with scope to develop; family home or the potential to run an owner operated chalet business. 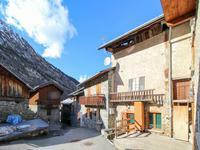 This village house for sale only 4km away from Plagne Montalbert, La Plagne, Paradiski is a renovation of an old grange and offers plenty of space, plenty of storage and the potential to develop. 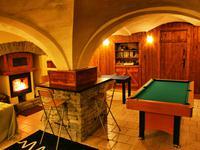 The downstairs vaulted cave, currently a TV/games room could easily be a separate apartment offering rental potential. The house offers a cosy open plan lounge, dining area and fitted kitchen , 4 large bedrooms, a small parcel of land, a short private driveway and an outside terrace for that evening bbq. There is easy access by car to the valley for a wide choice of amenities. 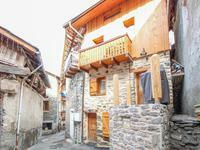 Plagne Montalbert (1350m) is a pretty village with a good choice of shops, bars and restaurants. The recently installed telecabine has transformed access to the high altitude slopes of la Plagne whisking you up to Le Fornelet (1970m) in only 6 minutes. Bathroom with bath, shower attachment and washbasin. 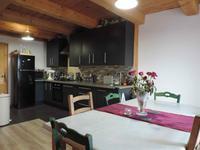 Through to the kitchen, dining area and lounge with wood burning and multi fuel stoves. The fitted kitchen has two ovens, dishwasher and a gas hob. Upstairs to the middle floor where there are two family sized bedrooms for 4 and 5 people and a large bathroom with bath, shower attachment, washbasin and WC. Upstairs again to the top floor with a further two bedrooms, one a family room for 4/5 people and the other a double with en suite shower room with WC and a small balcony. From the living area the house also has an attached barn that has been partly converted to provide a laundry room, workshop and a further shower room with WC. The rest of the barn could be developed. Finally, there is a downstairs vaulted cave that has its own wood burner and is currently a TV/games room. There are a further two rooms off this and it has its own separate entrance so there is the potential to make this into a spacious separate apartment. 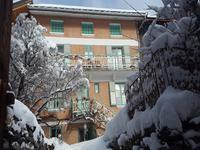 Outside there is a sloping driveway, wood store, ski locker, a small parcel of land and a terrace. A fine example of how you can get more for your money by moving away from the resort villages. 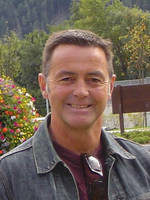 The La Plagne ski area is one of France’s best known ski resorts with slopes for all categories of skiers and boarders. With the Vanoise Express link to Les Arcs, the joint ski area, Paradiski, is one of the world’s great ski domains. 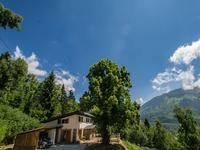 The Tarentaise valley is not just about the skiing with walking, cycling, mountain biking, white water rafting, canoeing and parapenting just some of the activities on offer in spring, summer and autumn. Self-drive. It is an approx 10-hour drive to the property from the main channel ports. By rail. 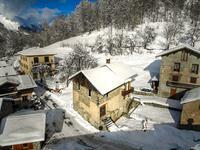 The nearest station is Aime la Plagne in the valley with a direct Eurostar service from St. Pancras in the ski season. By air. Chambery, Geneva, Lyon and Grenoble are the main airports serving the region.